Can Brisbane Learn From Its Older Sister? Eighteen months ago this northerner moved to Brisbane from Sydney to establish a personal project: an affordable, sustainable house and garden in an ordinary suburb. Tucked in a corner of the sunblock state, what makes Brisbane distinct? Horticulturally Sydney and Brisbane are sister cities: different yet similar. Many local Australian plants are native to both cities. Sydney is home to our oldest, largest subtropical garden and it’s the southernmost location that many near equatorial plants, like the Titan Arum, can be grown outdoors. My biggest shock was how much colder Bayside winter nights are compared to those of inner western Sydney. Hmm, so that’s why hydrangeas and coconuts grow well together in Wynnum. Without doubt Brisbane’s effusive, exotic garden flora, from Allamanda to Zingiber, is the campest in the country, with enough flamingo pink to make even Barbara Cartland feel at home. And Brisbane can, currently at least, claim the Macleay-McPherson Overlap, where the soils, climate and landform form a wonderfully cluttered mosaic of plant communities from tropical and temperate climes. ‘Currently’? Well with human-induced Climate Change well under way we’ll have to wait and see what copes, and what we’ll have to give away. Subtropical Brisbane claims the Macleay-McPherson Overlap with its wonderful mosaic of plant communities from temperate to tropical climates. Move over Melbourne: by 2050 migrating southerners will have made Brisbane the second largest city in the country. South east Queensland has Australia’s fastest expanding population, ballooning by about a thousand people every week. So can Brisbane learn anything from it’s older, larger sister? Let’s look first at her biggest mistakes: too much expansion and too little evolution. Sydney has expanded too far westwards, a region where it’s hotter in summer, colder in winter and always drier than along the coast. All those evergreen lawns, irrigated tropical gardens and swimming pools, aided and abetted by a professional gardening culture, have helped Sydney discover just what finite resources are all about. Unless there’s a big change in the weather Sydney, not Perth, may become the first western metropolis to run dry. Sydney’s gardening culture hasn’t evolved as the city expanded. Two droughts and a little discipline – watering restrictions – stopped enough amateur gardeners from gardening to lose the NSW gardening industry 11,000 jobs. Everyone from designers and growers to maintenance businesses and gardening magazines have been hurt. Brisbane gets less rain, evaporation rates are higher and it has bigger gardens. To keep Brisbane ‘liveable’ its city council wants to reduce stormwater flows, reduce water pollution, reduce peak demand for energy and to save potable water. As I have no desire to live beside polluted waterways, endure power cuts and buy drinking water from the supermarket we share some common ground. That’s how my project began. Despite rising costs, litre for litre bottled water still costs more than petrol. 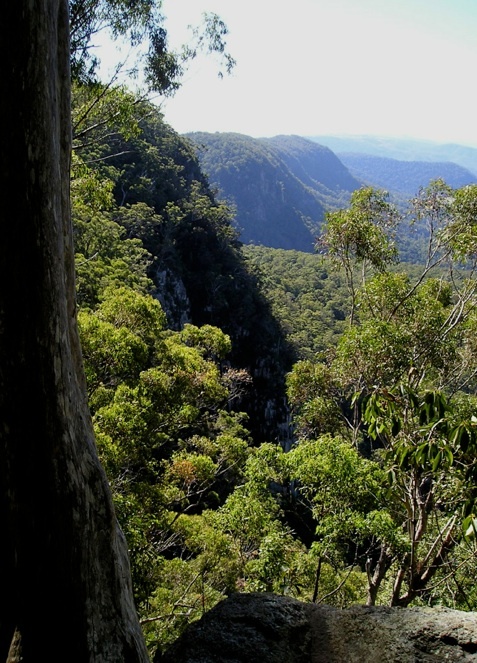 Brisbane has to finalise a sustainable water policy unless it wants to share its sister’s fate. As my garden slowly progressed through the driest year in a hundred (2005), I’ve been interviewed on radio, in the press and had progress filmed for TV. It’s great to know institutions are aware and professionals are interested. But what of the other 998 people who moved here the same week as we did? By 2050 we’ll need 0.5 million sustainable homes and gardens just to maintain the current levels of water pollution, watering restrictions and power failures as population and consumption grow. Clearly we need to focus not just on new arrivals and subdivisions, but also on existing housing and gardens to keep pace with other changes being imposed by Global Warming and the decline of an oil-based society. Easily said, but scary when even manufacturing solar panels needs some oil. By 2030 at the latest we’ll need to live and garden independently of oil. Positively growing. Subtropical gardening is improving its cultural identity thanks to professional contributions. Pictured: The Wicke’s garden, a recent and much treasured part of the Australian Open Garden Scheme near the Sunshine Coast. It’s good to celebrate the work of professional gardeners, but not uncritically. Many professionally designed gardens waste resources and help to degrade our environment. 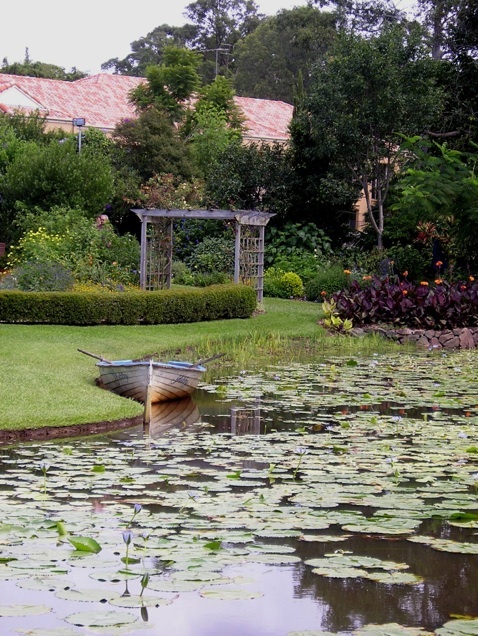 Quality sustainable gardens are still lonely examples, they’re not mainstream. Brisbane is a distinctive city and her gardens have much to be proud of, so conserving and improving her cultural identity is important. There is a growing number of positive, professional contributions to our subtropical gardening culture. Contributions such as an English-style cottage garden that needs no watering, debunking the myth that this garden style depends on heavy watering. A layered tropical garden so effective at remaining cool that council officers noticed its signature when studying thermal satellite images. A Claude Monet-inspired subtropical garden that could fool you into believing his Giverny garden is a cool climate interpretation of our own. Sydney’s professionals got together and formed the Designer Growers Network to promote the awareness and use of distinctive plants in quality landscapes. A breath of fresh air and an alternative to the homogenised developer/ landscaper favourites inflicted countrywide. But let’s not forget everyday examples of basic ‘sustainable gardening’. Lawns that aren’t sprayed or fed and which go brown in dry weather because they’re never, ever watered. Houses shaded by self-sown trees that were never weeded out. The gardens of the reluctant gardener. People with green space but who neither enjoy nor understand gardening and who don’t regard themselves even as amateurs. Just like garden insects, these gardens are numerous and frequently environmentally benign. But should sufficient reluctant gardeners be tempted to create a lush garden stocked with inappropriate plants, to use lots of chemicals, machinery and mains water to prop them up we will have seized defeat from the jaws of success. We will be repeating our sister’s errors while watching her pay for them. These haphazard gardens need to be included in sustainable city planning and their reluctant stewards won over to the fundamentals of responsible community gardening: basic stewardship. Like training people to put rubbish in bins, not on streets, it’s all about building buffers while we have the luxuries of disposable incomes, time and options. Professional gardeners are going to have to engage the reluctant gardener on their terms and mentor those who service their needs: the cut–price landscapers, tree loppers and yard clearers. Again we can learn from big sister’s mistake. Sydney Water promoted trickle irrigation as an efficient way to water whilst using less. The uptake was excellent, but because they didn’t educate people how to use them properly water use actually increased. 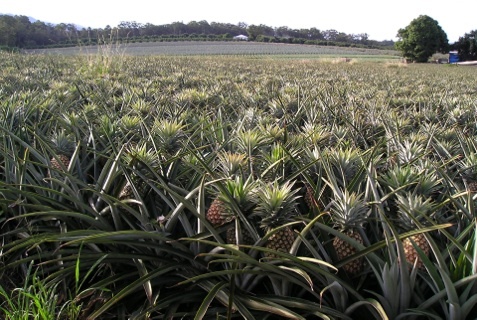 Are productive cultural landscapes, like this Beerburrum pineapple farm, valued enough to be conserved? Don’t get me wrong, I love Sydney, but I’m not blind to her problems. One solution that we can import has come from the extremely productive Hawkesbury area. Most productive smallholders have been driven off the land by a combination of greedy ‘developers’ and even greedier local councils. But even now most of Sydney’s side salads are still grown in the Hawkesbury. The continual rezoning and revaluing of land was swamping Sydney’s smallholders in subdivisions. Realising that their economic survival depended upon promoting their social and cultural value they formed an alliance with the department of agriculture. So began the Sydney Farm Gate Trail. This garden trail offers Sydneysiders fresh, seasonal produce, fine dining, a family day out with the option of overnight accommodation, all roughly within an hour of the cbd. Brisbane’s Ormiston House, now hemmed in by suburbia, grew Queensland’s first commercial crop of sugarcane. An hour’s drive from there you’ll still find fields of pineapple at Beerburrum and taro at Rochedale. The remnants of the smallholders’ contribution to subtropical living. Will Brisbane have a farm gate trail? Or just subdivisions? History shows society in crisis is capable of dramatic transformation. In two world wars government and industry built the capacity of the professional, amateur and reluctant gardeners of Britain. They abandoned ornamental gardening to grow food, and starvation and malnutrition were avoided. As Switzerland undertakes feasibility studies for wrapping their glaciers in insulation to prevent desertification [Ref: ABC News on line 22.3.05], our state government released its consultative ‘draft South East Queensland Regional Plan’ [Ref: Draft South East Queensland Regional Plan, Office of Urban Management, Dept. of Local Government, Planning, Sport & Recreation, Queensland Government, ISBN 0-7242-9654-9, October 2004]. This sets out their vision for development to 2025, five years before oil-free living and gardening begins in earnest. I have faith that the region’s experienced gardeners will stimulate a desire to reinvent subtropical horticulture, to conserve its cultural integrity and to coach the newcomers, the retirees and those reluctant gardeners. There’s time to reinvent ourselves from grassroots upwards, just as I’m doing at home. I’m impatient for change because the last thing 21st century Brisbane should want to copy is the history of our big sister’s first farm.